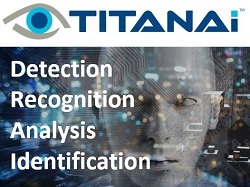 The TITAN VISION team from Visual Management Systems Ltd. would like to invite you to the International Launch of the revolutionary TITAN AI range of Advanced Imaging products at the forthcoming UK Security EXPO. Based around the latest Artificial Intelligence and Neural Network Technologies, TITAN AI has been specifically developed for security and safety applications. The TITAN VISION team will also be presenting the latest edition of the TITAN VISION PSIM solution and TITAN WALL - the enhanced Video Wall processor and management suite.